To Cite: Babaei V, Saghaei Y, Zeraatgar Gohardani H, Vali F, Teimourian S. Effects of Different Environmental Factors and Virulence Factors, dupA and iceA Genes, of Helicobacter pylori on Peptic Ulcer, Jundishapur J Microbiol. 2017 ; 10(5):e40161. doi: 10.5812/jjm.40161. Background: Helicobacter pylori is colonized in stomach and has a significant etiological role in different kinds of digestive diseases. Helicobacter pylori has the ability to devastate duodenal mucus causing peptic ulcer. Breakage of stomach lining is also seen more often among people who accustomed to consume tobacco, spicy (or sour) foods, alcohol, coffee, and tranquilizers as well as those who are exposed to heavy meals and stressful-life events (stress ulcer). Also, it seems dup A and ice A genes are involved in H. pylori etiology. Objectives: This study aimed to determine the relation of jhp0917 and jhp0918 genes, ABO blood type, and some environmental factors with peptic ulcer. Methods: In our study, 500 gastric mucosal biopsy samples from digestive tract were examined by rapid urease test (RUT) and 16s rDNA PCR test for H. pylori infection followed by histopathological examinations. The dup A and ice A genes were also evaluated by PCR. Results: In H. pylori colonized peptic ulcers, dup A gene showed no significant relation with peptic ulcer. On the other hand, iceA 1 (+)/ iceA 2 (-) genotype of H. pylori showed a strong association with peptic ulcer (P < 0.05). Conclusions: ABO blood group showed no association with H. pylori infection. Peptic ulcer had a significant relationship with consumption of tobacco (P < 0.05), consumption of tranquilizers (P < 0.05), and meteorism (P < 0.05). Helicobacter pylori is a spiral, filamentous, Gram-negative bacillus with about 3.5 micron length and 0.5 micron width (1, 2). It colonizes in human stomach and is of high etiological importance in digestive diseases such as gastritis, stomach ulcer, stomach cancer, and peptic ulcer (1, 3, 4). Colonization of H. pylori in gastric mucosa has a prevalence of 5 to 10% up to the tenth year of life (5). Peptic Ulcer (PU) is an open sore that develops in lining of stomach or the upper part of the small intestine (6). It often causes single, and sometimes, multiple ulcers in stomach called Zollinger-Ellison syndrome (a severe Peptic Ulcer with hyper pH in stomach) (7). The most important risk factors are potable water, tobacco, alcohol, meteorism, tranquilizers, age (more than 50), family history, tiredness, long hours of work, unbalanced diet, and NSAIDs e.g. aspirin (7). Jhp0917 and jhp0918 genes of H. pylori are important in its virulence. There are three classes of virulence genes in H. pylori: lineage specific genes, phase-variable genes, and genes with variable structures/genotypes. Among lineage specific genes, the cag pathogenic Island is the most identified one (4, 8). Jhp0947 and dupA (duodenal ulcer promoting) genes belong to this class of genes. However, they reside outside of the cag pathogenic island involved in the severity (9). The second group, genes with transitive phase, includes six genes namely oipA, sabA, sabB, babB, babC, hopz that code for bacterial outer membrane proteins (9, 10). The last group of pathogenic genes includes genes with variable structures/genotypes (e.g. vac A) (1, 4). In 2005 (11), Lu and colleagues studied dupA gene, jhPO917, and jhpo918 in different types of H. pylori and introduced them as superior candidate markers of peptic ulcer in Japan, Korea, and Colombia. It seems that dupA is more prevalent among patients suffer from peptic ulcer and it is less prevalent among patients affected by stomach cancer (11, 12). There are many reports indicating the relation of this gene with digestive diseases (12-15). A lately described putative virulence factor of H. pylori is iceA. This gene exists in at least two allelic forms, iceA1 and iceA2. IceA1 is up-regulated upon contact of H. pylori with the gastric epithelium (16, 17). The next plausible risk factor for peptic ulcer is host blood type. There are reports that individuals with O blood type are more susceptible to peptic ulcer in comparison with those with other blood types (6). Other eventual risk factors are environmental. We mention some as following: coffee (18), alcohol consumption (19), smoking (20), stress (21), spices (22), and nutrition (23). Because of scarce studies and controversial results in this subject, this study aimed to determine the relation of peptic ulcer with jhp0917 and jhp0918 genes, ABO blood type, and some environmental factors. 500 gastric mucosal biopsy samples were gathered from patients with digestive diseases in spring 2014. The general characteristics of patients such as gender, age, job, and history of drug consumption were obtained by their physicians. Because of inhibitory effects of antibiotics, non-steroidal anti-inflammatory drugs, H+ pump inhibitors, and bismuth compounds on rapid urease test leading to false negative results, the patients who had taken one of those drugs 14 days before biopsy were excluded from the study. Biopsy samples were prepared from the antrum within 2 cm of the pylorus. Helicobacter releases urease which can hydrolyze urea in urea cristiyance solution (Dako Corporation SL029) by incubating at 37°C for 1 hour. The ammonia product changes the color of the solution from yellow to red. Morphological features and aggregation of H. pylori in the tissue of each sample were carefully examined after treating each sample by formaldehyde solution (fixation) and staining by hematoxineosin (Dako Corporation SL029) according to the manufacturer’s protocol. Histopathological test made it possible to specify the chronic inflammation of the gastric mucosa by H. pylori infection according to the modified Sydney system. In peptic ulcers, the loss of substance was circular or elliptical, having 2 - 4 cm diameter and slightly elevated borders. The base was clean and finely granular. The histopathology of duodenal cancer was similar to that of adenocarcinoma. Rod spiral organisms surrounded by epithelial cell were seen by a conventional microscope. DNA was extracted from tissue samples using Fermentas DNA extraction kit (CAT: 00039826). The samples were either used immediately or frozen at -80°C until use in PCR. The PCR amplification was performed with 20 pM of specific primers (Cinaclone, Tehran, Iran) in a total volume of 25 μL. The 16srRNA forward primer was 5’- TAGCCACTGGAAACGGTGAT-3’ and the reverse primer was 5’- GTGTACTAGGCCCGGGAACGTATTC-3’ (24). The iceA1 forward primer was 5’- GTGTTTTTAACCAAAGTATC-3’ and the reverse primer was 5’- CTATAGCCATTATCTTTGCA-3’. The iceA2 forward primer was 5’- GTTGGGTATATCACAATTTAT -3’ and the reverse primer was 5’- TTTCCCTATTTTCTAGTAGGT -3’ (25). The Jhp0917 forward primer was 5’- TGGTTTCTACTGACAGAGCGC-3’ and the reverse primer was 5’- AACACGCTGACAGGACAATCTCCC -3’. For Jhp0918, the forward primer was 5’- CCTATATCGCTAACGCGCGCTC -3’ and the reverse primer was 5’-AAGCTGAAGCGTTTGTAACG -3’. The last two primers were designed by primer 3 software available at http://primer3.ut.ee. PCR products were confirmed by DNA sequencing. PCR amplification program was: 94°C, 1 minute; 60°C, 1 minute; 72°C, 1 minute, for 35 cycles. 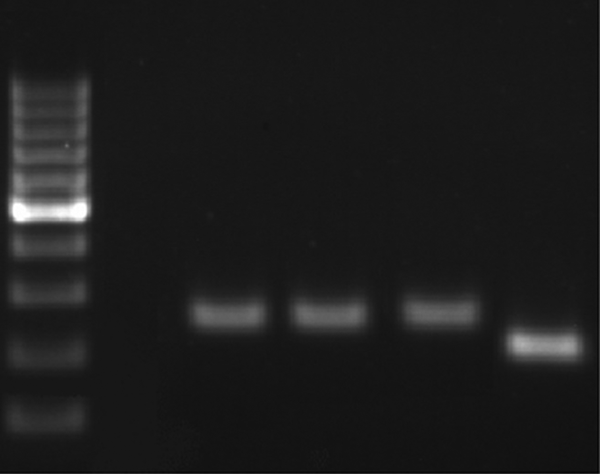 PCR products were then visualized under ultraviolet light on 2% agarose gel after ethidium bromide staining. To avoid false-negative results on PCR as a result of variations in the primer annealing sites, a dot blot was performed in all cases. For each single dot, 100 ng of sample DNA was mixed with 100 μL of denaturing buffer (0.8 M NaOH, 1.5 M NaCl) and spotted onto a Hybond N+ membrane (Amersham biosciences, Little Chalfont, UK) via 96-well Bio-Dot apparatus (Bio-Rad, Ivry-sur-Seine, France). DNA from the reference strain 26695, J99, SS1 (GenBank accession number AE001439) and human DNA extracted from peripheral blood cells were used as positive and negative controls, respectively. Chi square test was performed in SPSS 16.0 software. The data were considered to be significant at the level of P < 0.05. 500 biopsy samples were gathered from patients with digestive diseases. 200 patients were positive for peptic ulcer disease (PUD). 152 samples from these patients were positive by rapid unease test and 16srDNA PCR test. The remaining 300 patients who were negative for peptic ulcer manifested other diseases, non-ulcer dyspepsia (NUD). Non-ulcer dyspepsia patients were classified into two categories: gastritis (80%) and duodenitis (20%). The patients’ information is summarized in Tables 1 and 2.
aConsumption of more than 75 g of ethanol a week. bMore than one cup a day. cUsing the drugs for 2 years, 3 times a day (mostly Aspirin). From 152 PUD patients, who were positive by rapid urease test and 16S DNA, 72 were men and 80 were women. The average age was 50 years in men and 45 years in women. 89% of H. pylori positive patients, by RUT and 16S DNA, suffered from PUD and the others had NUD (11%). Peptic ulcer disease patients were classified into three categories: stomach ulcer (61%), duodenal ulcer (38%), and gastric cancer (1%). From 500 biopsy samples, 170 samples were H. pylori positive. 170 out of 170 H. pylori positive samples were positive for 16srDNA gene by PCR. All of the 170 samples were examined by PCR for dupA genes, and 50 of them were positive. PCR product size was 307bp for jhp0917 and 276bp for jhp0918 (Figure 1). The PCR products also were confirmed by sequencing. 170 H. pylori positive samples also were genotyped for iceA1 and iceA2 (Figure 2) 96 samples showed iceA1 (+)/ iceA2 (-) genotype. A, Amplification of jhp0917 gene of H. pylori (307 bp), M: 100 bp ladder, size marker, C+positive: 26695, J99,SS,01 to 04: positive samples and C-negative control; B, Amplification of jhp0918 gene of H. pylori (276 bp). M: 100 bp Ladder, size marker, C+positive: 26695,J99,SS,01 to 03: positive samples and C- negative control. Peptic ulcer ultimately develops as a result of defective balance between invasive and defensive factors in the mucous of stomach and duodenum. The clinical signs are dyspepsia with pain in upper central part of abdomen, puke, emphysema, and epigastric pain 45 - 60 minutes after eating or during night, which is relieved with anti-acid drug or vomiting. The signs are chronic weight and appetite loss, iron storage deficiency anemia, blood in stool, bloody vomiting reflux, and back and abdominal pain (6). This disease is curable by drugs or surgery. According to our data, H. pylori infection is one of the strongest predisposing risk factors for duodenal ulcer disease. The rate of H. pylori infection was 76% among PUD patients and 6% in gastritis non-PUD patients [Odds ratio: 49.6, 95% CI = 27.8 to 88.2 (P < 0.05)]. Studies in Scotland (6), Turkey (26), and Kurdistan (27) found a meaningful relationship between peptic ulcer and ABO blood group, which was not in agreement with the similar studies in Netherlands (7) and Taiwan (28). In our study, no meaningful relationship between peptic ulcer and ABO blood group was detected. According to our Investigation, tobacco is a potent risk factor for duodenal ulcer disease. Smoking habit was greater among PUD patients (85%) than gastritis non-PUD patients (14%) [Odds ratio: 21.3, 95% CI = 12.7 to 35.7, (P < 0.05)]. It is not in line with other surveys in USA and Japan (29) in which patients with functional dyspepsia had not shown any association with smoking. This finding is in agreement with the study in Germany (18). This study in agreement with other studies in Germany (18), USA (19) and Denmark (26) showed no significant association between alcohol consumption and duodenal ulcer. Coffee due to its caffeine content instigates the secretion of acid, reducing the compression of the bottom sphincter (18). This finding is similar to those of similar studies in Germany (18) and Japan (29) that showed no association between coffee consumption and duodenal ulcer. Excessive consumption of tranquilizer drugs such as aspirin can damage the coating of the stomach making it bleed (30-32). Our study in line with another study from china (30) showed non-steroidal anti-inflammatory drugs (NSAIDs) cause the vast majority of peptic ulcers and their complications, which was not in accordance with a similar study from Spain (32) [Odds ratio: 61.6, 95% CI = 34.9 to 109, (P < 0.05)]. In Japan, Korea, and Colombia, dupA has been reported to be associated with an increased risk of duodenal ulcer disease and reduced risk of gastric atrophy and cancer (33). However, in Western countries this association was not detected (33). Within our patients, there was no relation between this gene and duodenal ulcer. Dup A had a frequency of 27% among H. pylori infected PUD patients and 44% among H. pylori infected non-PUD patients [Odds ratio: 0.47, 95% CI = 0.17 to 1.29]. There are some studies indicating the relationship between H. pyloriiceA1 and peptic ulcer (34, 35). In our patients, there was a strong association between iceA1 (+)/ iceA2 (-) genotype and duodenal ulcer. The rate of iceA1 (+)/ iceA2 (-) genotype was 61% among H. pylori infected PUD patients and 17.6% among H. pylori infected non-PUD patients [Odds ratio: 7.63, 95% CI = 3.95 to 14.75]. Finally, we found a significant relationship between meteorism and peptic ulcer among our patients (P < 0.05). Ethical Approval: The work has been approved by the ethics committee of Iran University of Medical Sciences, numbered 93-04-30-25006, in compliance with the principles laid down in the declaration of Helsinki. All patients gave informed consent to the work. Financial Disclosure: Authors have no conflict of interest. Funding/Support: This study was funded by Iran University of Medical Sciences grant number 93-04-30-25006 in Tehran, Iran.